August 02 2015. If you've been wondering how some of your favorite USATF Masters athletes have been doing outside of USATF in other visible races in the first 7 months of 2015, here's some updates. I am picking out results based on name recognition; my apologies, in advance, to any Masters runners I miss or important races I fail to list. This is not any kind of official list, it is just mine. My use of the term, 'USATF Masters athlete' is loose; it just means I recognized their name (or thought I did) from one of the many USATF Masters results lists I look at. Races like the Bay to Breakers are omitted because I found no USATF Masters Athletes listed among the top age group finishers. Houston Half Marathon. Jan. 17 2015. Colleen DeReuck (Boulder CO) was the first masters woman, and 3rd overall to finish, clocking 1:17:56 [AG 95.15%], not bad for age 50! Jason Butler (Oklahoma City OK), who took 2nd in the M40 division of the USATF 15K Championship at the Tulsa Run last October, took 2nd in this iconic half marathon that starts off the year.His time was 1:13:12 [AG 83.22%]. Kaiser Permanente San Francisco Half Marathon. Feb 1 2015. Brian Pilcher (Ross CA) took 1st in the M55 group (and 2nd Masters overall) in 1:14:50. Sharon Lemberger took 1st in the W40 group, and 2nd overall Master's Woman in 1:23:18. Jaymee Marty was 1st in W45 and first overall Master's woman in 1:23:03. Honor Fetherston took the W60 crown in 1:35:13. Gasparilla Distance Classic. Tampa FL. Half Marathon. Feb. 22 2015. Jen Rhines (Boston MA) took 1st among all women Masters runners in a time of 1:12:35 [AG 92.93%]. Terri Rejimbal (Tampa FL) took 1st in the W45 group in 1:24:30 [AG 83.86%]. Eric Stuber (Lansing MI) took first in M50 in a (net) time of 1:17:34 [AG 84.72%]. Gate River Run [Jacksonville FL]. March 14 2015. Jen Rhines (Boston MA), 40, took overall Women's Masters honors (and 6th overall) in 51:36 [AG 92.06%] in this venerable 15K run. Despite being in rehab for a gamey hamstring, Paul Carlin (Indianapolis), 69 nonetheless took 5th in M65 on gun time in 1:10:48 [net time 1:10:40=AG 77.44%]. United Airlines NYC Half Marathon. Mar. 15 2015. Kathy Martin (Northport NY), 63, won the W60 prize in a time of 1:30:36 [AG 96.88%]. Sharon Vos (Old Greenwich CT) took 2nd in 1:31:29 (92.04%). Carlsbad 5000. 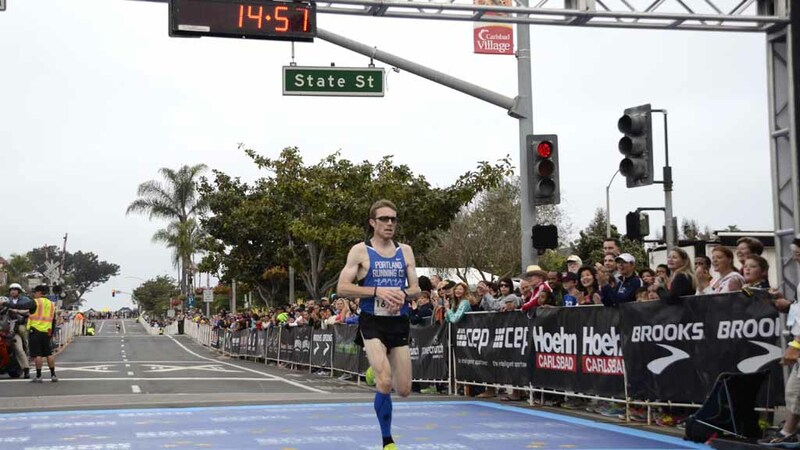 Greg Mitchell (McMinnville OR) was the first Masters runner in, clocking 14:58 [AG 92.25%], followed by John Gardiner (Rancho San Margarita CA) who took 2nd in 15:22 [AG 90.49%]. Gardiner's teammate, Christian Cushing-Murray (Santa Ana CA) finished 4th in 15:37 [AG 92.35%]. Rob Arsenault (Riverside CA) took 8th in 16:12 [AG 90.37%]. On the women's side it was Julie Ertel (Irvine CA) taking 2nd in 17:52 [AG 85.92%], Tania Fischer (Santa Monics CA)in 18:06 [AG 90.31%] leading in Celestine Arambulo (San Diego CA)18:09 [AG 86.57%] and Grace Padilla (Los Angeles CA)18:15 [AG 84.73%]. Christine Kennedy (Los Gatos CA) took 10th and only missed breaking Kathy Martin's W60 5K record by 5 seconds, clocking a 19:10 [AG 96.72%]. Cherry Blossom 10 Miler. Washington D.C. [Rerouted short course because of incident on course before race=9.39 miles=15K, not 10 miles] Jen Rhines (Boston MA) was 16th overall and 8th overall American woman, 1st Masters overall and 1st in W40 in 53:04 [AG 89.52%] Joan Samuelson (Freeport ME) took home the W55 trophy in 58:50 [AG 96.85%]. Sharon Vos (Old Greenwich CT) took W60 honors in 1:03:55 [AG 92.78%]. Ken Youngers (Tucker GA) won the M55 group in 55:02 [AG 89.39%]. Phillippe Rolly (McLean VA) claimed first in M40 in 49:36 [AG 86.47%]. Boston Marathon. April 20 2015. Nuta Olaru (Longmont CO) won the W40 group in 2:48:28 [AG 85.46%]. Bean K. Wrenn (Boulder CO) took 5th in the same group in 2:50:32 [AG 82.42%]. Joan Samuelson (Freeport ME) took 1st place int he W55 group in 2:54:03 [AG 96.94%]. Sharon Vos (Old Greenwich CT) won the W60 group in 3:12:51 [AG 91.24%]. Ulrich Steidl (Seattle WA) finished 3rd in the M40 group in 2:25:58 [AG 88.61%]. Ricardo Maldonado (Scottsdale AZ) won the M50 group in 2:41:10 [AG 85.87%]. John Ouweleen (Sebastian FL) finished 3rd in M70 in 3:36:17 [AG 80.77%]. Blue Cross Broad Street Run. Philadelphia. May 1 2015. Abby Dean (Philadelphia PA) took 2nd in the W40 division in 1:03:00 [AG 82.82%]. Doreen McCoubrie (West Chester PA) took 1st in the W50 division in a nifty 1:03:29 [AG 91.69% ]. Julie Hankin (Malvern PA) took 2nd in the same division in 1:08:58 [AG 81.38%]. Coreen Steinbach (Pompey NY) raced across the line in 1:13:33 [AG 91.63%] to claim a well-earned 1st in the W60 division. Kenneth Barbee (Philadelphia PA) took 1st in the M50 division in a handsome 56:37 [AG 87.73%]. One America 500 Festival Mini (Half) Marathon. Indianapolis. Gary Romesser (Bradenton FL) the Masters Hall of Fame runner, is back from his Achilles injury. He took the top prize in the M60 age group and clocked a 1:25:21 [AG 86.90%]. Tom Dever (Terre Haute IN) clocked a fine 1:18:55 [AG 87.89%] to claim 1st in the M55 division and Lucie Mays Sulewski (Westfield IN) took 2nd in the W40 age group in 1:23:15 [AG 83.50%]. Marin Memorial Day 10K. Kentfield CA. May 25 2015. 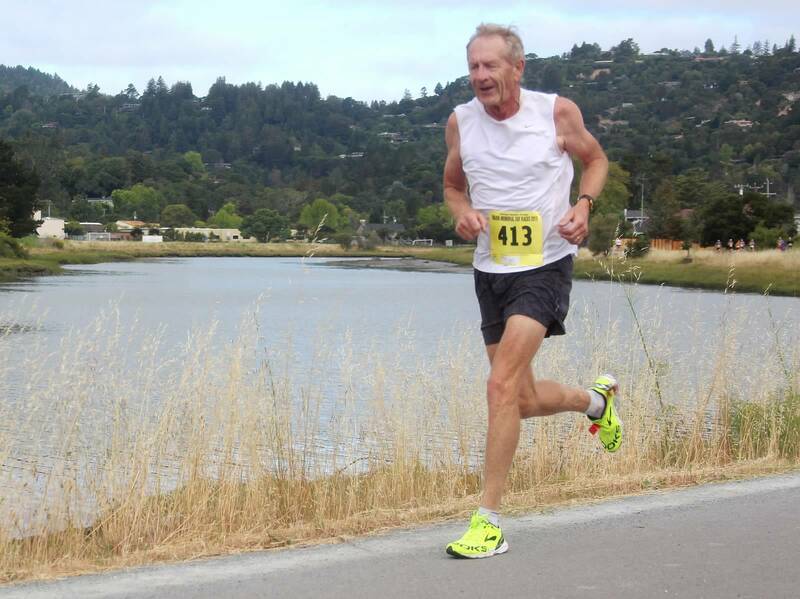 Jan Frisby (Grand Junction CO), always a threat for Age Group Runner of the Year when fit, showed he is definitely fit in his 71st year. He broke the national M70 record for 10K with his 40:14 [AG 90.9%]. Len Goldman (Oakland CA) took 2nd in the division in 42:16 [AG 85.52%]. Jaime Heilpern (San Francisco CA) claimed first in the M45 division in 32:42 [AG 88.16%]. Brian Pilcher (Ross CA), the 2013 Runner of the Year, took first in the M55 division in 34:14 [AG 94.08%]. After an injury slowed him down a couple of years ago, Tom Bernhard is back with a vengeance, winning the very competitive M60 group in 37:14 [AG 90.59%]. Kirk Larson (Atlanta GA), ran his usual fine race but his 39:27 [AG 85.5%] could only count for 5th place in the M60 field. Sharon Lemberger (Menlo Park CA) took 2nd in the W40 division in 36:57 [AG 85.05%]. JoAnne Rowland (Concord CA) clocked 48:24 [AG 88.71%] to take the W65 division. Grandma's Marathon. June 20 2015. Duluth MN. Alan Evans (Beaver Dams NY) took 3rd in the M50 division in 2:51:58 [AG 81.19%]. Abby Dean (Philadelphia PA) finished 5th in the W40 group in 2:57:24 [AG 80.44%]. Andriette Wickstrom (Storm Lake IA) took 1st place in the W60 group in 3:27:39 [AG 84.74%]. Gerry Bjorkland Half Marathon. June 20 2015. Duluth MN. Phillippe Rolly (McLean VA) won the M40 division in 1:11:14 [AG 85.52%]. Peachtree 10K. Atlanta GA. July 4 2015. Kevin Castille (Lafayette LA) was the first Masters runner to finish in a time of 30:37 [AG 92.66%], also winning the M40 age group. Ken Youngers [Tucker GA] took 1st in M55 in a time of 36:18 [AG 88.73%]. Jerry Learned (Gainesville GA) took 1st in M65 in a time of 43:46 [AG 77.07%]. David Turner (Clarkesville GA) took honors in the M75 competition in 57:54 [AG 66.95%]. Boilermaker 15K. Utica NY. July 12 2015. Melissa Senall (Fairport NY) took 1st in the W40 division in 1:02:21 [AG 77.86%]. Audra Naujokas-Knapp (Rochester NY) took 3rd in the W45 group in 1:08:31 [AG 72.11%]. Mike Nier (Rochester NY) claimed first place in the M50 group in 55:50 [AG 82.07%]. Reno Stirrat (Rockaway NJ) won an M60 battle with Mark Rybynski (Manlius NY), taking the race in 58:52 [AG 85.94%] to 59:21 [AG 84.44%]. Beach to Beacon 10K. Cape Elizabeth ME. August 1 2015. In this classic 10K race honoring Joan Benoit Samuelson, Sharon Vos (Old Greenwich CT) brought home first place in the W60 category in 42:39 [AG 91.18%]. Jan Holmquist (Burlington MA) took first in the W70 group in 47:13 [AG 96.68%]. (I guess it would be asking too much for Holmquist to break her own national record every time she runs 10K!). Sheri Piers (Falmouth ME) was the first Masters runner in with a time of 35:40 [AG 90.16%]. The first 'Senior' finisher [age 50+] on the women's side was Mimi Fallon (Walpole MA) in 38:30.1 [AG 89.03%]. Who's missing for part or all of the first 7 months of 2015? Lloyd Hansen. M65. Lloyd was the M65 Runner of the Year in 2014 and also took the 2014 Individual Grand Prix for the group. He took on all comers, winning every USATF race he competed in. Now in the third year of the age group, Lloyd faced a new challenger this year in Ignacio Jimenez. Lloyd finished 2nd to Jimenez who took the M65 crown at the USA XC Championships in Boulder CO by racing past Lloyd toward the end of the race. In the 8K championship at Brea the order of finish was repeated but Jimenez had a wider margin of victory this time. Lloyd was honored by the Road Runners Club of America as their Male Masters Runner of the Year in April in Des Moines Iowa (as part of the Drake Relays events). He took the opportunity to jump into their Half Marathon but was unlucky and developed a stress fracture. Lloyd was finally able to resume training in June but his best race so far is a 19:57 at the Draper Days 5K. Looks like he is getting much of his fitness back. We wish Lloyd all the best and anticipate his presence at the top of the podium in several races this fall. By the way, Lloyd has also been very active working behind the scenes to improve the USATF Masters LDR infrastructure, serving on the Athlete's Advisory Committee, and since January on the MLDR Executive Committee. Thanks, Lloyd! Sabra Harvey. W65. In her first year in the age group in 2014, Harvey set a new 10K age group record at Dedham and, I thought, a new 5K record at Syracuse (not currently listed on the USATF records site however). Surprisingly then, I find no race results for her in the first 5 months of 2015. I presume she was injured. Some evidence for that is her first race result of the year, a 21:21 result in a local 5K race. That was apparently 1:24 slower than her time the previous year. Harvey is entered in the USATF 1 Mile Championship in Flint Michigan on August 21st. Let's hope that is a signal that she is all the way back to the top of her racing fitness. Christine (Chris) Kennedy. W60. Now in her first year in the W60 group, Chris is eager to leave her mark on the record books. Her main goal is to become the first woman 60 years of age or older to break 3 hours in the Marathon. She will attempt that at the Chicago Marathon on October 11th. She has already broken the W60 records for 8K at Brea CA in 31:27 and for the 10K in Dedham (James Joyce Ramble) in 39:24. The 5K mark just escaped her 19:10 attempt at the Carlsbad 5000. She found time to win her group in one of Bob Anderson's Double Road Races in her home state of California in early May but no races since. Presumably she is deep into her serious training for the Marathon now. Katherine (Kathy) Martin. W60. Overall Runner of the Year in 2013 and Age Group Runner of theYear more times than I can keep count of, Kathy is regularly atop the standings when not injured. Now 63, she took the prize at the United Airlines NYC Half Marathon on March 15th in 1:30:36 and came back two weeks later to take the ASPIRE 10K in 41:08. She was clearly on her game at that point. Two weeks later she tuned up for the USATF 10K Championship by winning a local 4 mile run in 25:44. It looked like she was ready to roll but did not appear for the USATF 10K championship in Dedham MA on the 26th of April. That's likely a sign she is injured. And, indeed, I can find no other races for her until late June. On June 28th she took her age group in a local 5 mile run in 33:10. Let's hope that's a sign that she will be ready for the fall season. Tom McCormack, M60. 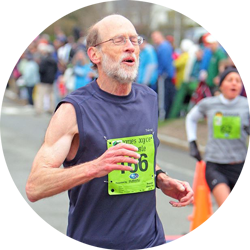 A member of the famed Irish Brigade at East Tennessee State in the early 1970's, Tom burst onto the national masters road racing scene in late 2013 with wins at the 5K XC Championship in New Jersey and then at the.US National 12K road race in Alexandria VA. In 2014 he won everything in sight and broke a 5K record at Syracuse that had stood for 28 years. Surprised at the finish line at the 8K Championship in Brea CA, we knew Tom would be looking for revenge later in the year. But he has had to put those plans on hold as he has dealt with injury. In late March a Tom McCormack was able to win a local10K race in East Tennessee. I presumed that was our man and it looked like he might have fought off the injury. But there have been no race results since that time so I fear he is still in rehab mode. Let's hope he is back on the roads racing in the fall season. Peter Mullin. M60, joining M65 later this year. Mullin has been one of the top Masters runners over the last several years. He had an excellent first half of the 2014 season, winning the Chevron Houston Half Marathon to start the year off with a 1:21:05. He then took the USATF Half Marathon Championship in Melbourne FL with a 1:21:55 [those 2 bridges can slow one down!]. He also captured the crown at the USATF 8K championship at Brea and then the Crescent City 10K in 37:21. He ran almost as fast at the USATF 10K at Dedham but ran into the buzzsaw in the person of Tom McCormack so had to settle for 2nd place. He apparently sustained an injury in the Falmouth 7 Mile run as his time was way off his usual standard. By November, Mullin was able to run a sub-19 minute 5K but was still not up to the sub-18's he was running earlier in the year. And 2015 started off slowly for Mullin as well as he slowly regained form. He ran over 90 seconds slower than he did in 2014 at the Brea 8K. Although he did run in a couple of local races in March and April in Texas, there have been no results posted since then. Mullin was able to compete in the USATF Masters Outdoor TF Championships in Florida. He finished 2nd in the M60 1500 in 5:18.95 and first in the M60 5000 meter run in 19:34. His results there suggest he is still not quite back to full fitness. Gary Romesser. M60, joining M65 later this fall. Gary sustained an Achilles Injury that kept him out of racing for the 2014 year. But he is already in the Masters Hall of Fame and is one of the few runners who has been able to manage injuries well enough to run at a national level for his entire career. As an Open Athlete he won the Indianapolis Mini Marathon (1/2 Marathon) 4 times (and added one more after he joined the Master's ranks). Early in 2015 there were the first signs that he had licked the Achilles problem and was back on track as he ran some sub-20 minute 5K's in local races in Florida. A longtime resident of Indiana, Gary relocated to Florida in the autumn of 2014. By May 2 2015, he was ready to return home to compete in what must be one of his favorite races, the Indianapolis Mini-Marathon. Like most of us older athletes, Gary has good days and bad days, but this signaled his age group competitors that on his good days he will be a force to be reckoned with. Gary is running for the New Balance Sarasota team now and recently took home the Senior Grandmaster first place prize for the team at the Firecracker 5K on the 4th of July. Paul Carlin (yours truly) M69, joining M70 in late October. I had a great first half of 2014. I won the M65 USATF Half Marathon Championship at Melbourne FL in 1:29:29, took 2nd to the indomitable Lloyd Hansen at the Brea 8K Championship in 32:11, and 2nd to the illustrious Bill Dixon at the USATF 10K championship in 39:53 (my first world class age-graded performance--by the 2010 tables in force at the time). I also had some other fine races, taking the M65 1st place at the Fifth Third River Bank Run (25K) in 1:46:27, qualified for the Boston Marathon with a 3:18:37 at the Charlevoix Marathon in June. Three weeks before, I ran one of Bob Anderson's Double Road races [10K--forced break--5K]. I ran okay but did not handle the break well, so I was not fully warmed up at the start of the 5K and felt very awkward. I gradually loosened up though and ran okay. I was surprised that I had not run as fast as I had in the 15K at Tulsa the previous year. But I was told that was not unusual. I then made the mistake of running one of my long runs (20 miles plus) the very next day, a Sunday, and found it pretty taxing. But 3 weeks later I ran a pretty good marathon. I was aiming for a faster time but for a first time marathoner, I had to be pleased. More surprising to me, it did not seem to take me too long to recover. Three weeks after the marathon I was able to run 19:42 in a local 5K race. But that was a false signal. Later in July I started to notice a slight deterioration in my training runs and when I was training on some dirt roads in Maine, encountered a slow day or two. Despite that, I was able to take my age group at Joan Benoit Samuelson's Beach to Beacon 10K in 40:39. The drive home from Maine left me quite stiff and my workouts that week were not very good. On Tuesday I felt some pain in the upper hamstring/attachment area and slowed my 220 and 440 intervals substantially. I toed the starting line at a local 5 mile race on August 9th with some trepidation. As it turned out, though, I was able to race just fine, clocking 32:24. The day after, Sunday I ran a good, easy 7 mile run at about 8.5 minutes per mile, fairly normal. Monday I ran a good, fast set of 440 intervals with no hint of trouble. But on Tuesday, I could not run below 9 minutes a mile for a 4 + mile workout without substantial pain in the high hamstring area. That was the beginning of a frustrating 11 month period. After taking some time off of running without the usual quick recovery, I saw a Sports Doc in early October (after being unable to run in the USATF 5K Championships in Syracuse) and commenced Physical Therapy (PT). It was successful and by early November, I was back at about 90% of my normal fitness. 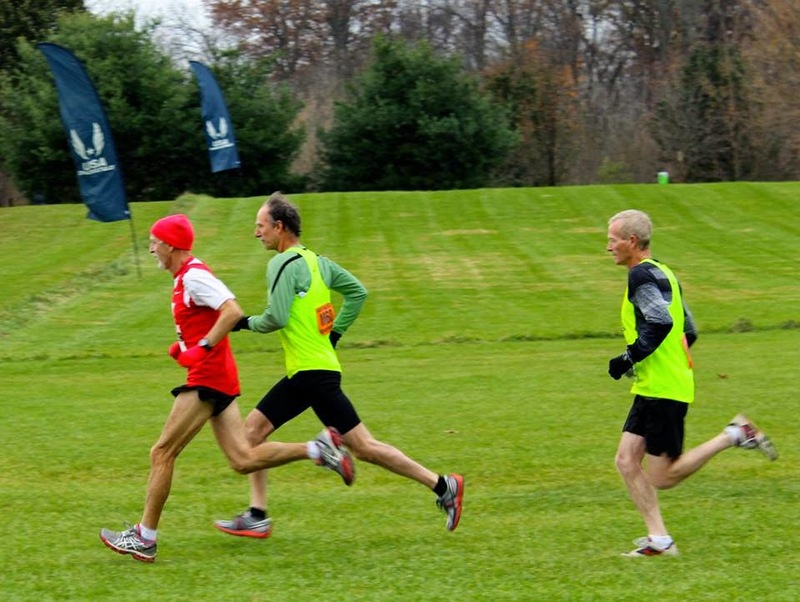 I ran as part of a team in the USATF 5K XC Championships, held in Carmel IN. I was lucky enough to finish 2nd to Lloyd Hansen again and, more satisfying, was the all important 5th runner for my winning team. I really enjoyed running with a great bunch of guys. And I almost made it through the whole race with no mishaps. Unfortunately, with about 100 yards to the finish line, I almost fell, caught myself and felt a shooting pain in the attachment area of my hamstring. I finished the race on adrenaline but unwisely waited around on a chilly, blustery day for the entire set of ceremonies. That set me way back. And that has been the story ever since. On two occasions I got back to somewhere in the 85-90% range and in both cases suffered a setback a day or two after a really good workout. By early June I was able to run a 5.5 mile workout including a 6:45 mile, a 3:19 half mile, and a 92.5 quarter mile. The next day I was barely able to finish a 6 mile run at a 9 minute per mile pace. On the 2nd of July I started PT again. I had to bypass the Beach 2 Beacon 10K in Maine on August 1st; I would hate to run a very slow time with an elite Masters number. I hope to get up and past the 90% fitness barrier this time with the help of PT but only time will tell if I can. Best effort so far has been the 8:11 per mile pace in a 5 mile race I managed today (August 8 2015). So there is still plenty of work to do.